If you enjoy the theatre, concerts and world famous entertainers, then you'll love the fact that Freedom Plaza is conveniently close to Ruth Eckerd Hall, the Straz Center and other great art venues. 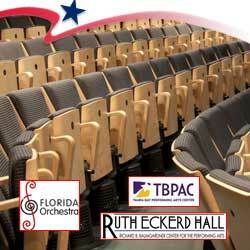 Ruth Eckerd Hall - Located in Clearwater, Florida, is convenient to all Tampa Bay communities and serves a five-county area. Mahaffey Theater - Considered one of the most beautiful rooms in central Florida, the Mahaffey Theater is host to the Florida Orchestra, Broadway entertainment and contemporary performers. The David A. Straz, Jr. Center for the Performing Arts (Formerly the Performing Arts Center) - Located on a nine acre site along the east bank of the Hillsborough River in Downtown Tampa. It provides an environment for a wide variety of performances, concerts, and events. The 300,000 square foot, state-of-the-art complex is the largest performing arts center in the Southeastern United States. The Florida Orchestra - Recognized as Tampa Bay's leading performing arts institution, one of the leading professional symphony orchestras in Florida, and one of the best regional orchestras in America. Tampa Theatre - Open year-round with a full schedule of film, concerts, special events, corporate events and tours, the theater is one of the most heavily utilized venues of its kind in the United States.